Yesterday I shared a few of my favorite vacations ... & one of my worst 😉. If you missed it, you can read it here. And since I just did that post, I thought I would share a few tips I have for the amazing ... incredible ... best ever ... Disney cruise! I may eventually stop talking about that cruise one day, but today is not that day. If you saw my instastory the week before we left for our cruise, then you probably remember hearing me talk about Dan & I surprising our kiddos with a new back pack filled with goodies. We wanted them to have stuff to do during the long drive to Florida but then also they needed a carry-on to carry their swim suits/change of clothes in as well so it worked out perfectly. We gave them to them the night before we left & they LOVED them! We filled each back pack with snacks, a water bottle, several different Usborne activity books, autograph books (Cooper's / Millie Jo's), a new pair of pajamas, a pair of sunglasses, a Disney coloring book, a box of crayons, a notepad & erasers. Thank you, Target dollar bin 😊. We found Cooper's back pack at Target. They no longer have that exact one but this one is similar. And Millie Jo's is Pottery Barn Kids ... with a little Disney monogramming by my mother-in-love. We will definitely keep this idea in mind the next time we take a trip that consist of a long car ride! And now for a few tips I have . . . I don't know about y'all, but when I'm going some place new, I like to research. I like to know tips, ideas, suggestions, pros/cons [this cruise had NO cons]. 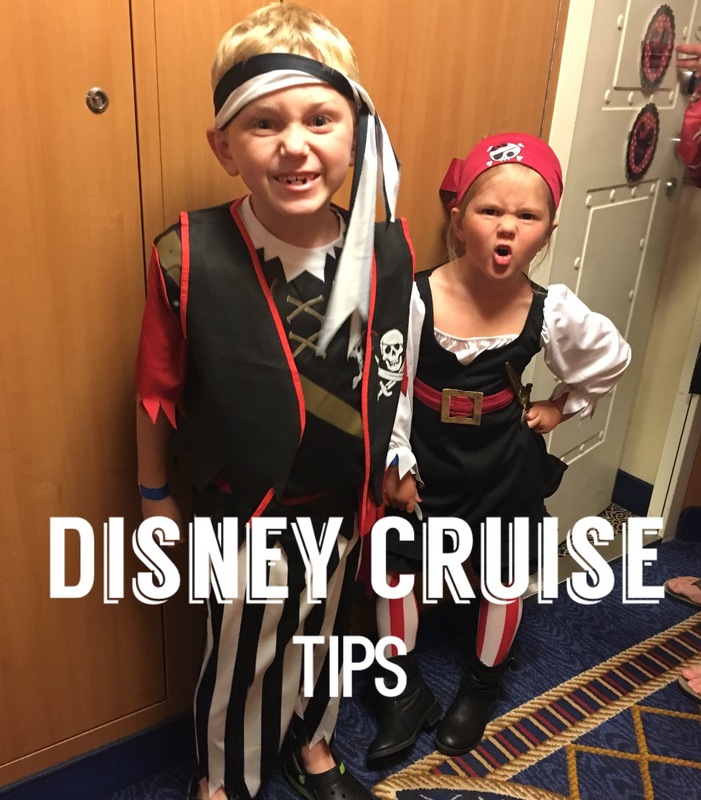 So I came up with a list of my very own tips & I hope they can help y'all out if you are planning a Disney cruise of your own. In February, early online check-in became available so we checked in & scheduled our port arrival time. SO quick & easy. 2. Early registration for kids. After we checked-in online, I went straight to the kids registration tab & got both kiddos taking care of. I highly recommend early check-in/registration. Once we arrived to the port terminal, it was all literally a piece of cake! 3. Carry your bathing suits & a change of clothes in your carry-on. You won't get your luggage until later so if you have plans to head to the pool, have your bathing suit with you. And also a change of clothes in case you don't get your luggage before dinner. We actually got our luggage early! 4. Reserve princess/Anna & Elsa meet & greet tickets. All the princesses, including Anna & Elsa, were a must for Millie Jo so while you're online doing early check-in, go ahead and reserve your meet & greet tickets. Pssssst, they sale out fast! We waited in NO lines to see the princesses. And if you don't reserve tickets in time, no worries ... the next night they will have a meet & greet that doesn't require tickets, you may just have to wait in a line. 5. Take an autograph book. My kiddos LOVED seeing how all the characters signed their names! 6. Take advantage of room service. I have six words for you ... Mickey ice cream bar and cookie. No charge. Need I say more!?! 7. Go to ALL the shows. Yes, all. They're amazing & super kid friendly! Let your kids go to the kids club at least once ... if not more. At first, we felt guilty for sending them but they LOVED it! People had told us if we didn't let them go then they were missing out. It's true! 9. Participate in Pirate Night. Whether you carry a plastic sword around, wear a bandana, pretend to have a hook as a hand or you wear a complete costume. Have fun! I can assure you, most everyone on that ship will be dressed up! 10. Go to the fireworks show. On pirate night they do a big fireworks show. Go! And after the fireworks, stay for the huge dance party they have. Hands down the best night! My kiddos danced around as pirates with "pirates" all night & thought it was the best thing. I hope y'all have a happy Wednesday!